I’m talking about a photo that’s being shared on Facebook, of a letter. Enclosed you will find the check you mailed to us regarding the account of Christopher. 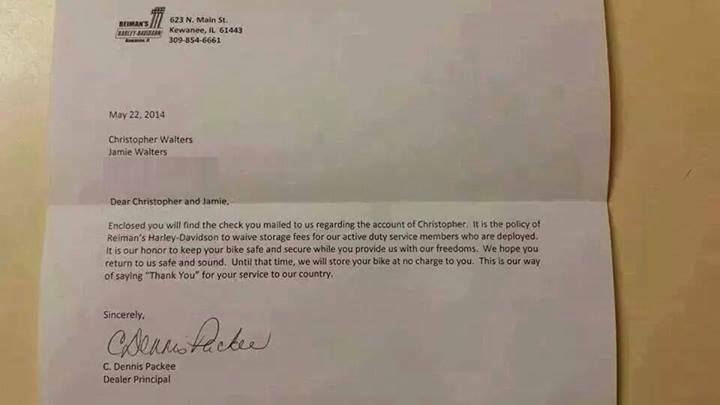 It is the policy of Reiman’s Harley-Davidson to waive storage fees for our active-duty service members who are deployed. It is our honor to keep your bike safe and secure while you provide us with our freedoms. We hope you return to us safe and sound. Until that time, we will store your bike at no charge to you. This is our way of saying “Thank you” for your service to our country. 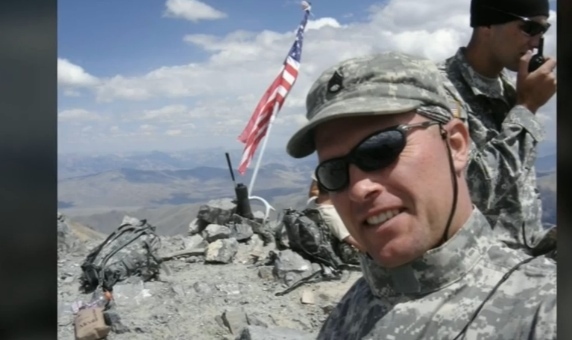 The backstory is Christopher Walters is currently deployed to Afghanistan. His wife, Jaime, had sent in a check and an apology for being late on a payment to her husband’s account. He had been renting storage space at Reiman’s for his motorcycle while he was deployed. When the dealership owner Dennis Packee saw the letter, he would have none of that and sent the money back to her. Mr. Packee didn’t think much about the gesture and went back to work. It’s Reiman’s H-D policy and seemed like common sense to him. The letter got posted on Facebook and then the phone began to ring… from people all across the U.S. who expressed their appreciation of the gesture. Thank you Mr. Packee for the gesture and giving back to those that have given much! Photo courtesy of Reiman’s H-D.
It’s been a disturbing week. Earlier in the week I watched a program on the History Channel – 102 Minutes That Changed America. It was video taken from numerous vantage points in NYC spliced together to provide a minute-by-minute recant of the events on September 11, 2001. Major shout-out to History Channel for running it without the onslaught of a bunch of inappropriate commercials! Like many of you I remember exactly where and what I was doing on September 11th and the gamut of emotions I went through. While watching the History Channel replay the events I started to reflect about the eleven years since 9/11 and how much has changed. Ugly barriers went up around public facilities not to mention how navigating airports has become a new kind of nightmare. The American lexicon included new words like: Taliban, al-Qaida, extremism, anthrax, axis of evil and ground zero. There was the federalization of airport security, enhanced border security, Patriot Act and domestic spying through the Presidents Surveillance Program (PSP) and FISA amendments. You can view a number of law changes HERE. Even more disturbing is how the post 9/11 glow of “lets-all-get-along” has faded. Nothing has deteriorated faster than the political discourse. The culpability extends to both parties. The bitter and divisive assaults have not lifted up the nation in a more principled and honorable direction. One side shouting that we have a foreign-born, socialist, anti-colonialist, Kenyan-like Muslim who pals around with people bent on destroying the economy through Obamacare. The other side shouting about an “obstruct and exploit” strategy… sort of a “scorched earth” mentality to win at all costs. It’s really the same old antics to manipulate the public dialog, rather than elevate it. Then there was the attack in Libya which killed J. Christopher Stevens the U.S. 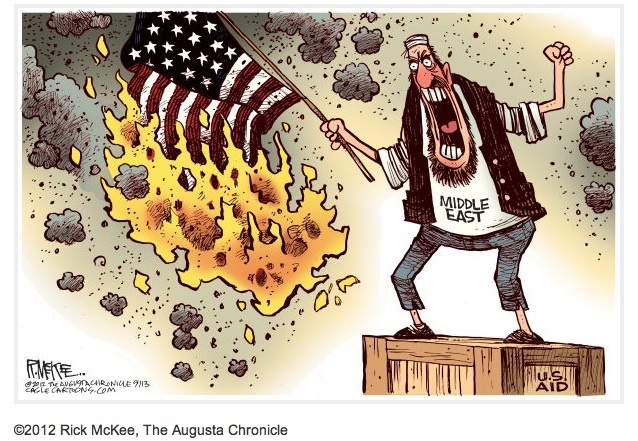 Ambassador and three other Americas by protesters angry about an American “film” – “The Innocence of the Muslims” – which they deemed hurt their religious feelings and justified murder. Piling on were the flag burning attacks in Yemen and the U.S. embassy in Egypt. What I wanted to write about is how living in Portland, OR isn’t like living in a military town, where everyone is either a service member or is related to one. Here in “P-town” we’re all caught up in our own little latte worlds. And having lived in both types of communities I think it’s somewhat easier for folks in Oregon to be complacent and forget about the war. Meanwhile service members continue to render salutes and follow orders into fierce battles in Afghanistan… Sure there is ample room for debate about how and why America got to where it is today, but I cringe at the thought that it’s getting harder to remember a time when we haven’t been at war. 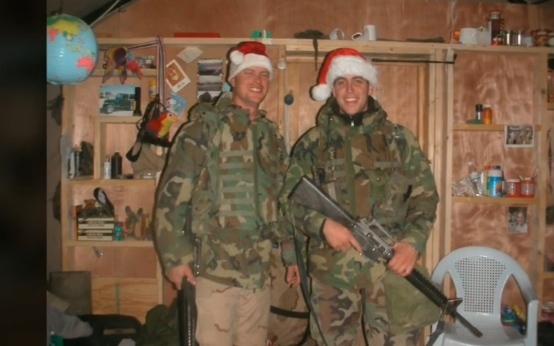 And speaking of the war, I wanted to provide a shout-out to a couple soldiers, who went under-appreciated each day of their lives while serving in the conflicts. One of my riding buddies (James) served in Baghdad, Iraq during the onset of the war. I remember receiving an email from his family with a photograph of him sitting in a boat on the Tigris River. I posted it up in my work cube. It made me feel connected and the photograph served to remind me of the harsh conditions he lived and I when I looked at it I would hope for a safe return. One of his best friends was 1st Sgt. Troy Wood. They served together in Iraq as combat engineers and bridge builders, but also spent time patrolling the rivers. It was dangerous and difficult work. 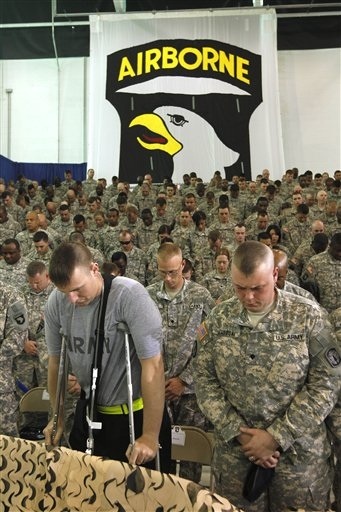 And, I’m fairly certain they didn’t join the military to bow and kowtow to everyone on earth who hates us. Sadly, I learned this week that Troy passed away as a result of injuries sustained in a motorcycle accident. I didn’t know Troy, but as a 20 year Army veteran and dear friend of James, I guarantee you he was a good and generous man. I’m deeply sorry for your loss James. 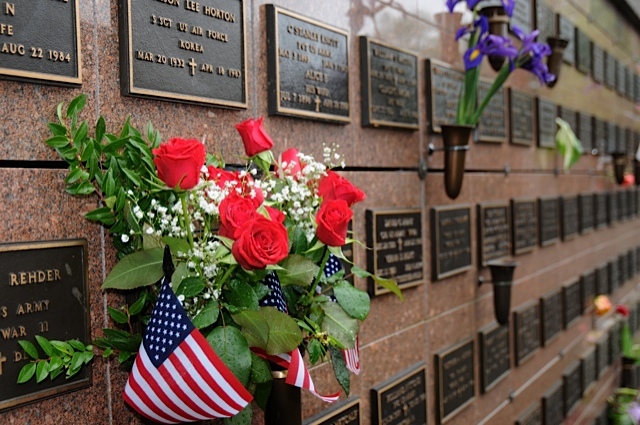 During this 11th anniversary week, I suggest that we not only honor the lives lost on 9/11, but that we honor the men and women that have and continue to serve our country – they go under-appreciated each day of their lives. Photos courtesy of Jake Wood. Cartoon courtesy of Rick McKee. Ashcroft Motorcycles opened its doors in Salem, Oregon back in 1995. The shop is owned by Lynn Ashcroft who builds full custom “hot rod” oriented motorcycles and custom automobiles. Joe Miller manages the shop on a day to day basis with a staff that varies between 4 and 6 individuals. Mr. Ashcroft is also known as the honorable Judge Lynn E. Ashcroft. However, he resigned his position this week on the Marion County bench in a one-sentence letter to the governor and Supreme Court chief justice under allegations of official misconduct. Mr. Ashcroft has a colorful background and a lot more information is available on the Oregon State Bar web site. According to the Statesman Journal, Ashcroft left the bench for personal reasons and to avoid a public battle to defend himself. All of this surrounds a 2008 case, where Ashcroft made an unsympathetic remark to a defendant, Heather Parks, after he denied her court-appointed counsel. 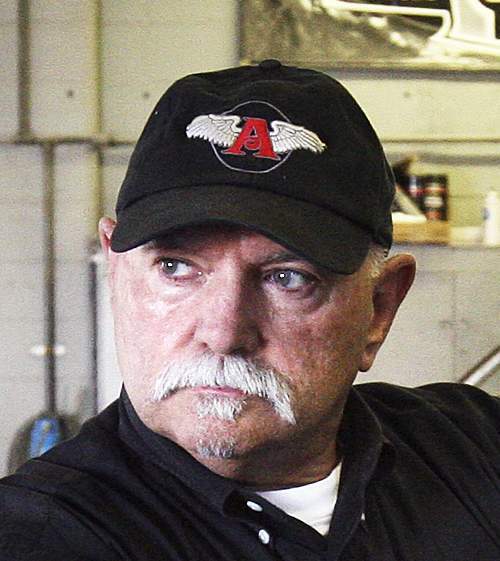 Besides being a ‘hot rodder’ and custom motorcycle builder, Mr. Ashcroft is a former Brigadier General and served both on active duty in the United States Army and in the National Guard as an Armor Cavalry Officer, Infantry unit commander and a Judge Advocate General officer. He was the senior partner in a law firm (Ashcroft & Wiles LLP) with offices in Salem and Portland, Oregon. The bikes mix traditional motorcycle and “rodding” designs and components incorporating modern technology and ideas. Ashcroft began customizing motorcycles after purchasing his first Harley-Davidson in 1992 and modifying it to fit his own style. He began coming up with his own designs and taught himself how to weld, machine, and build them. The custom-designed motorcycles have drawn national attention — having been featured in magazines such as The Robb Report, MotorCycling, Stuff and Easy Rider. A Pendleton native, Ashcroft has an affinity for designing cool motorcycles and is well respected for his customization work. The motorcycle community is better served with him working full-time on bike building. If he needs another thrill ride, maybe he’ll decide to become an activist and help take on some of the motorcycle legal battles such as biker profiling? By this time you’ve already heard that our President, Barack Obama, a man who ran on a platform of hope and change, is getting us deeper into Afghanistan. Isn’t Al-Qaeda in Pakistan? And, if the Soviets couldn’t win there, why can we? A country owned by China with disastrous financials (that’s us, in case you didn’t recognize your homeland). 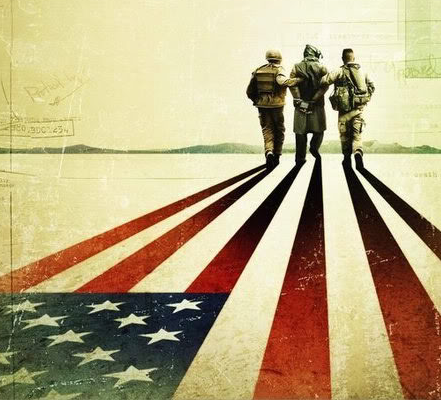 If you join the armed forces to serve your country, to pay your bills, you’re entering Hotel California. It seems you can never leave. You jumpily wait for people to attack you or detonate IEDs. Coming home to a country that pays you lip service, but doesn’t give a rip because people can’t find a job. If you come home at all. And if you do return, you’re likely traumatized. Meanwhile, Goldman Sachs is paying record bonuses and their Chairman Lloyd Blankfein says the firm is doing God’s work. Huh? What deity does Mr. Blankfein pray to who wants to see the populace suffer? Used to be Wall Street helped build America, now traders just profit off exotic investment instruments. But there is good news (sarcasm alert!). The enormous financial outlay of the 8+ year war has brought into sharp focus Bagram Airfield, where off-duty soldiers can obtain everything from Kyrgyz massages to purchase a BK burger. Including a Harley-Davidson motorcycle. According to AFP reports, the dealer for those away from the front lines sells about 4 motorcycles a month to U.S. servicemen. With another 30,000 troops being deployed, and most of them set to take off or land on Bagram’s runway in route to fight the Taliban it means H-D should expect a sales increase proportional with the troop surge. In fact, I just read a post on the H-D forum from a soldier who bought a 2009 Night Train yesterday. Congrats Army_Train85 and thank you for your service!! At any rate, as Bagram turns into a military “boom-town”…H-D is poised to take advantage. Photo courtesy of Corbis/Shaun Schwartz.